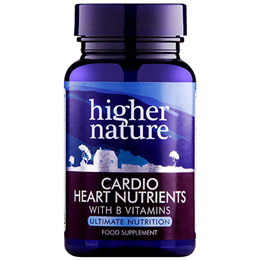 Cardio Heart Nutrients supplies key nutrients to support a healthy heart and circulation. It includes the antioxidants, Coenzyme Q10 and Vitamin E, plus TMG (tri-methyl glycine) and Vitamins B6, Folic Acid and B12 to help maintain balanced homocysteine levels. Higher Nature`s Cardio also contains Arginine and Bromelain. Betaine anhydrous, l-arginine HCI, capsule: hydroxypropyl methylcellulose (colour: red iron oxide; colour titanium dioxide)*; l-carnitine l-tartrate, bulking agent: microcrystalline cellulose; bromelain (carrier: potato maltodextrin); co-enzyme Q10, d-alpha tocopheryl succinate, anti-caking agent: silicon dioxide; anti-caking agent: magnesium stearate*; pyridoxine HCI, thiamin HCI methylcobalamin, folic acid. Take 2 capsules twice a day, 30 minutes before meals or 2 hours after meals or as a health professional advises. Herpes simplex (cold sore) sufferers are advised to consult a health professional before taking this product. Below are reviews of Cardio Heart Nutrients - TMG - 30 Vegicaps by bodykind customers. If you have tried this product we'd love to hear what you think so please leave a review. Cardio Heart Nutrients supplies key nutrients to support a healthy heart and circulation. It includes antioxidants and vitamins, plus TMG to help maintain balanced homocysteine levels.